How to draw Sailor Moon Anime character Serena Tsukino or Usagi Tsukino. Tsukino is the main protagonist of Sailor Moon. 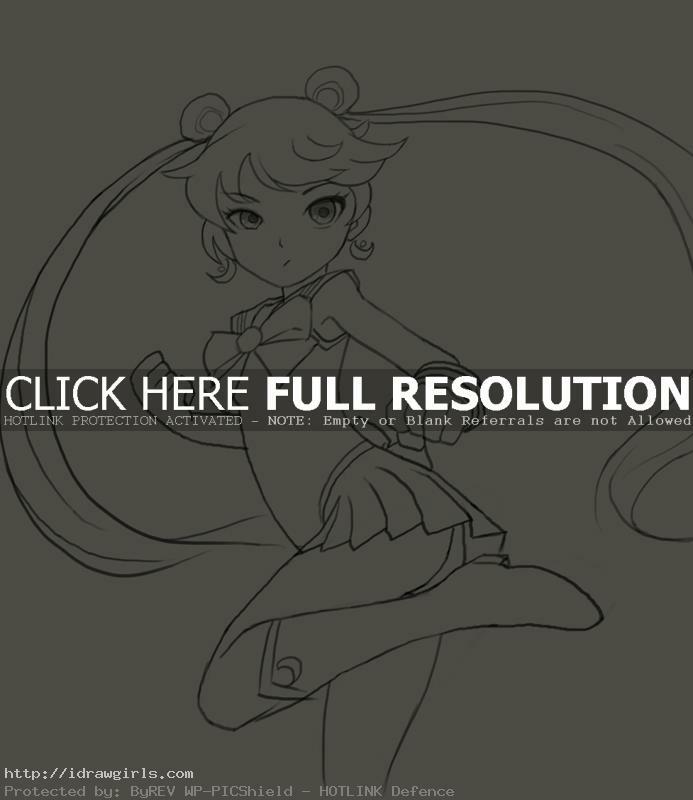 In this tutorial you will learn to draw a Manga character Sailor Moon. I will show you step by step drawing her face and body in a back kicking or side kick pose. This version of Sailor Moon Anime drawing is more like a tribute to the Manga. I like the character, but I will just use my own style of drawing applying to this tutorial. It is easier for me to do it in my own way or style of Anime drawing. Some of you might not like it because it is not the same style as the original. But hey! It is my blog, I draw what I’d like to draw. Before I start a drawing, I did rough sketch. I usually start my rough sketch with simple geometry shapes to construct the basic Manga head and body. By following this process, you will find drawing is lot easier. It is very important to get the shape and proportion right in the beginning. If you understand its basic foundation, it will be easier to draw anything. If you want to be good at drawing, you will have to practice at least couple hours a day. Sailor Moon is a magical action-adventures of a teenage girl who learns of her destiny as the legendary warrior Sailor Moon and must band together with the other Sailor Soldiers to defend the Earth and Galaxy. Serena Tsukino is an ordinary, ditzy, 14-year-old girl or so she thinks. She discovers a talking cat named Luna, who reveals Usagi’s identity as “Sailor Moon”, a special warrior with the destiny of saving the planet Earth, and later the entire galaxy. Now Usagi must now find the Moon Princess and protect Earth from a series of villains, beginning with the Dark Kingdom that had appeared once before, long ago, and destroyed the Kingdom of the Moon. 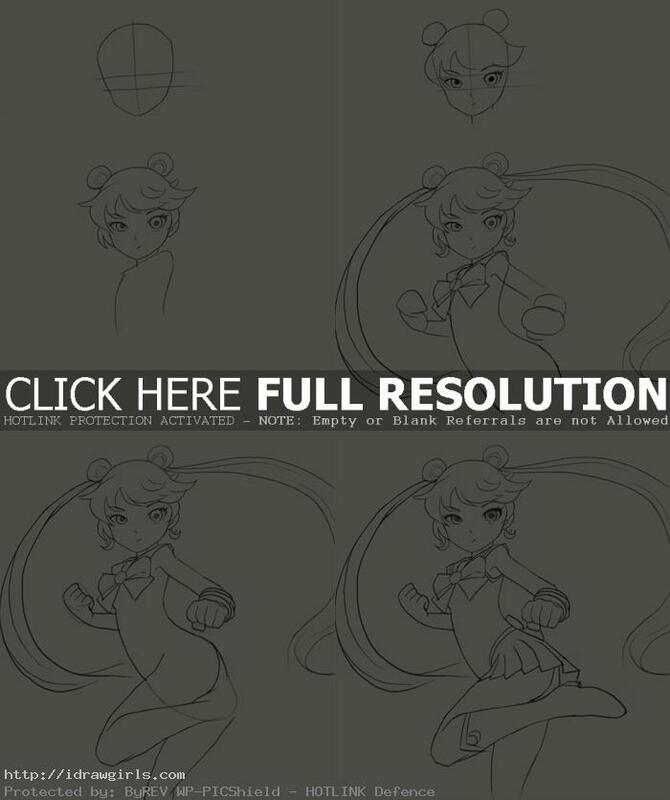 Below are step by step how to draw Usagi (Serena) Tsukino from Sailor Moon. Step one, I start a basic circular shape for a head along with construction lines for eyes and mid-face. Step two, I drew both eyes inside the paralleled horizontal lines, then nose and lip. I also added her hair bang in front and two buns on top. Step three, I finished the head and sketched out her rough shoulder and torso. Step four, I drew her long pig tails, bow on her chest, and body. Then I rough sketched her arms. Step five, I drew her hips and upper legs. Step six, I finished her arms, hands, skirt and the rest of the body. Thanks buddy! You could work on both at the same time. It is better to diversify your skill. I think i’ll read/watch every show/manga/comic that the characters you draw come from. You must’ve drawn them for a reason. I have always heard of Sailor Moon for example but i’ve never actually gotten around to seeing it. Thanks for the tutorial. And also, i’ve seen that to be able to get my own style i should work on drawing the human figure realistically before i apply any styles. There’s just so many different ways to draw characters!